What better pick-me-up on Monday than this…? 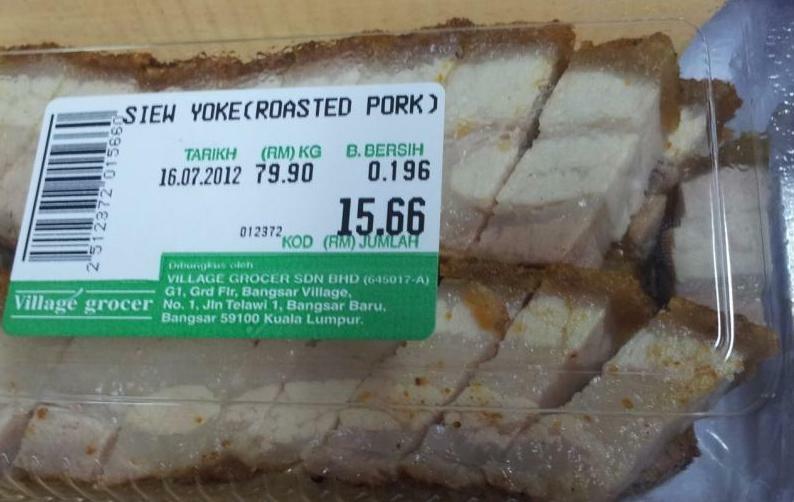 Succulent 5 layer roast pork / siew yuk !!! Went for lunch and decided to ran to the village grocer to grab some ham for breakkie tomorrow. The guy tempted me with a generous slice of roast pork. Who can refuse, right?! One BITE and I am sold. IT was definitely GOOD quality siew yuk. The skin is crispy without being too hard. The meat is really juicy and not too fat. yumz.. yumz..
IT’s abit expensive. But, to make your Monday suddenly look so much better and brighter? It’s worth it. hehehe. Bought some back for Dinner tonight !!! (Hub !!! Look, roast pork for dinner !) Yay !! !